Time is on your side with your iPod. On an iPod touch, you can set multiple alarms to go off on different days and set a variety of tones and sounds for your alarms that play through its speaker. On an iPod classic, you can even assign a playlist to an alarm to play through external speakers or headphones. Tap the Clock icon on the Home screen and tap the Alarm icon along the bottom of the display. To add an alarm, tap the plus (+) button in the upper-right corner of the display. The Add Alarm screen appears, with options and a slot-machine-style wheel for setting the alarm time. Slide your finger over the wheel to set the hour and minute and a.m. or p.m.
Slide until the selection you want appears in the gray window on the slot-machine wheel. Now you can set some optional features, or you can skip to Step 8 and be done with it. (Optional) Tap the Repeat option to set the alarm to repeat on other days. (Optional) Tap the Sound option to select a sound for the alarm. A list of sounds appears; touch a sound to set it for the alarm. (Optional) Tap the On button to turn off the Snooze option or tap the button again to turn the option back on. 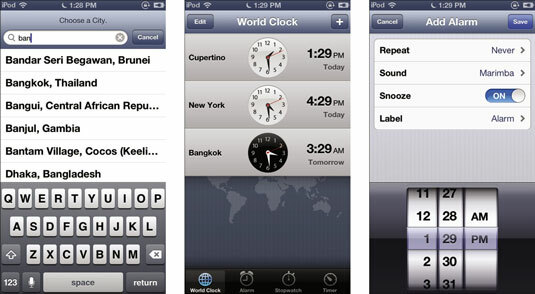 With the Snooze option, the iPod touch displays a Snooze button when the alarm goes off, and you tap Snooze to stop the alarm and have it repeat in 10 minutes (so that you can snooze for 10 minutes). (Optional) Tap the Label option to enter a text label for the alarm. The label helps you identify the alarm in the Alarm list. Tap the Save button in the upper-right corner to save the alarm. When the alarm goes off, your iPod touch displays the message You have an alarm, along with the Snooze button if the Snooze option is turned on (refer to Step 6). Slide your finger to unlock the iPod touch to stop the alarm’s sound, or tap the Snooze button to stop the alarm temporarily and let it repeat 10 minutes later. To delete an alarm on an iPod touch, tap the Clock icon on the Home screen and tap the Alarm icon along the bottom of the display. In the Alarm list, tap the alarm you want to trash, and then tap the Edit button in the upper-left corner of the display. The alarm appears with a circled minus (–) button next to it; tap this button, and then tap the red Delete button that appears to delete the alarm. Choose Extras→Alarms from the main menu. The Create Alarm and Sleep Timer options appear on the Alarms main menu. Choose Create Alarm and press the Select button. Highlight the Alarm option and press the Select button to turn it on. Choose Date from the Alarms submenu. The Date display appears with the month field highlighted. Change the field setting by scrolling the click wheel. Scroll clockwise to go forward and counterclockwise to go backward. Press the Select button after scrolling to the appropriate setting. The next field is now highlighted. Repeat Steps 5 and 6 for the day and year. After you finish scrolling and then selecting the Year field, the Alarms submenu appears automatically. Choose Time from the Alarms submenu. The Time display appears with the Hour field highlighted. Repeat Steps 9 and 10 for minutes and AM/PM. After finishing the AM/PM field, the Alarms submenu appears again. Choose Repeat from the Alarms submenu and choose a repeat multiple. You can choose to set the alarm to go off once, every day, weekdays, weekends, every week, every month, or every year. After choosing a repeat multiple, the Alarms submenu appears again. Choose Alert from the Alarms submenu and choose a tone or a playlist. The Tones and Playlists options appear in the Alerts submenu. Choose Tones to select a beep, or set Tones to None if you want the iPod classic to display the alarm without making a sound. Choose Playlists to select a playlist. After choosing a tone or a playlist, the Alerts submenu appears again; press Menu to go back to Alarms. Choose Label from the Alarms submenu to set a label to identify this alarm. You can set labels for your alarms so that you can identify them easily in the Alarms main menu. Select a label from the prepared list. After choosing a label, the Alarms submenu appears again. Press Menu to return to the Alarms main menu, which now includes your new alarm with its label in a list of alarms under the Sleep Timer heading. You can create as many alarms as you need. To delete an alarm, select the alarm from the list on the Alarms main menu. The Alarms submenu appears with a list of options. Choose Delete. When the alarm goes off, your iPod classic displays an alarm message along with the Dismiss and Snooze buttons. Choose Dismiss or Snooze by scrolling the click wheel and then select it by pressing the Select button.